I bought this amp used in Australia in 2018 (>20 years old). Someone had re-capped it before and thus its performance may differ from when it was new. I use it to drive Wharfedale Diamond 9.3 speakers and the 25W/ch output is more than adequate. The sound that comes from the amp is highly enjoyable. It sounded more refined than my previous Onkyo stereo receiver. Perhaps it is something to do with system matching. The tuner is very strong and is able to pull in all local stations cleanly with a simple wire antenna. The FM radio output has great depth, clarity and is extremely enjoyable. I listen mainly to classical music and pair my Diamond 9.3s with a powered Yamaha sub set at low volumes. Strings, guitar and organ music are fantastic. Jazz and even pop are great too. Even though the amp does not have any streaming options, I have overcome them with a Chromecast paired with a HDMI audio extractor, all in for about $90. In relation to headphone hum: The headphone output sounded very clean at the place I bought it but there was a hum when I brought it home. Soon after, I relocated to another country (also 240V) and installed it with a ferric core on the power lead. Once again, the headphone output was clean. I suspect that the incoming power quality caused the hum. Dry solder joints and lifted PCB tracers: There were a couple of dry solder joints that caused reliability issues. I rectified those and repaired a lifted PCB tracer using some wire and the amp came back to life. The service manual is freely available online and I used it for the repair. If you are comfortable repairing electronics, or know someone who is able to, I would recommend this amp if you can get it cheap. If not, you may be taking a risk, especially with older equipment. The build quality of NADs of this era were not fantastic. Very strong tuner, great as a pre-amp. The bass and treb. are set at zero and sound amazing. Simplistic design, very easy to work. Matches Carver very well!! None as far as I can tell. I just bought a new NAD 712 reciever for use with my "new" Carver M-1.0t power amp. 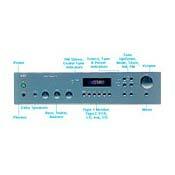 I'm using the NAD 712 as a pre-amp/tuner and it works superbly. It's very easy to switch back to a reciever by putting the "horseshoes" in again. This works excellent as a pre-amp and I am extremely happy. A good product, and an excellent value. Compared the amp section with my Rega Elex integrated - sounded different, but not better or worse. Dynamic beyond what you could expect from the 25 Wpc spec. Connected to a good FM roof-mounted antenna - the 712 pulled in a lot of stations with relatively low noise in stereo, and a good sound quality. Sensitivity was better than that of my Rotel RT-850A tuner. Watch for system synergy - the 712 might not suit bright sources and/or speakers. The 712 sounded good, except for one flaw, there is a 60Hz buzz that comes from the pre-amp stage. Many receivers that come with a Remote control seemed to have this problem (I noticed it in Rotel units with a remote control). I didn't get a real answer from the NAD folks about this when I returned it, but It is probably noise from the motor that changes the volume knob that is affecting the potentiometer. I don't know if it is bad parts or bad design. Hopefully they are looking at this problem. This noise was harder to notice through the speakers, but very obvious with headphones. Buy an amp that doesn't have a remote control. I found the NAD 312 integrated amp satisfied me with its sound and price. I agree with Rik about his comment on the 60Hz hissing problem. My NAD712 also has the same problem, especially if you are using a headphone at low volume (7-8 o'clock dial position) over quiet music pessages. When the dial position goes beyond the 9 o'clock position, the hissing noise decreases. The hissing noise is not noticeable over speakers, unless you are listening within a foot from the speakers.I am keeping the receiver, because it does the job well at this price range. It also goes quite well with a pair of B&W 302 speakers. This receiver is definitely not for critical audiophile listening, but it is an excellent starter system, great for the den. I love the sound of this receiver and the tuner is very good. Music on FM has good depth and detail. It is very powerful for its rating, it even drives my inefficient Platinums pretty well, though I'll probably eventually get a power amp (100 or more watts). I agree that I wish it had a phono stage, I bought the NAD stage, nice and detailed, but for only a little more I could have got the 312 integrated that has a phono stage and bi-amped ! Many of you are wondering about the 25-watt power rating and how it sounds like more. Remember that #/watts don't define a current. #/amps, distortion, and impedance are more important when considering high-end equipment. Just look at the amps costing 1000's of $; a lot of the stuff is like 20 watts a channel! Since I haven't listened to this receiver yet - I just wanted to address this question - please disregard the star rating. Great sound and very good FM tuner. This is a very good value for those looking for a mid to high-end receiver and don't want to spend thousands. NAD conservatively rates their equipment and the 25WPC does a very good job of driving my PSB Stratus Mini's. I find the amplifier to be very quiet -- have had no noise problems of any kind, either through the phone jack or the speaker outputs. Very refined, high quality receiver with good remote control. Note that the receiver has preamp output, which is very handy if you step up to a power amplifier, which I eventually did. Great receiver. I love it. Very efficient. My guess is that the output rating is way under what it really delivers. I've never put it even near half volume it cranks so well. And I'm a drummer! I compared it with several units in a good store and could hear the difference clearly. The only downside is that I don't really love the way the tuner controls work. There are 'modes' for tuning: preset, scan, fine tune. The same tuning buttons depend on the mode setting to determine how it will move from channel to channel. Its just a bit awkward from the unit itself but works much better from the remote where it is actually an advantage. I also don't like that it seems that the radio circuit is allways on. Even when I'm listening to a CD, the display shows the station that I was last tuned to and the signal strength light flashes. I have never detected any trace of bleed through though. I'd also like it if the unit had a phono preamp stage. Overall I absolutely love the sound of this NAD. This was a great purchase! I was originally looking at one of the AV receivers, but they were a bit too pricey. When I listened to this product, it blew me away and I couldn't beleive that it is only 25 Watts! Sounds more like 70Watts. This is my first product in home audio, outside a 12 year old boom box, so perhaps I am easily impressed, but I listened to a lot of more expensive recievers, all be it mostly AV receivers, but none had the earthly rich tones. Most other receivers sounded a bit brassy, so it was an easy choice. I am listening to it through Monito Audio Monitor 4s. Not a bad set up I have to say. If you are on a budget, as most of us are, and don't need a lot of bells and whistles, the 712 is the one to look at first and last. And, if you are in Chicago, check Saturday Audio Exchange. They don't work on commission, and are more helpful than anyone else in the city.